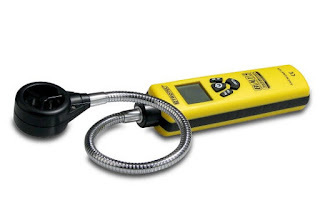 The Trotec BA-15 Flexible Impeller Anemometer is an anemometer capable of measuring cubic airflow volumes, airspeed and air temperature. Featuring a semi-flexible goose neck probe, 40cm in length, the BA15 can be bent to shape, then positioned into small confimed places to attain an airspeed measurement. For airflow measurements, the CMM measurement mode ( m3/ min) allows the cubic measurement to be determined. Simply enter the area of the aperture being measured ( in metres) into the BA15, and ensure 100% of the air is passing through the impeller. 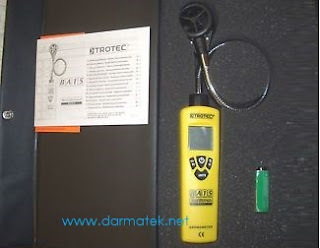 Darmatek is Trotec BA-15 Impeller Anemometer Sales Online Shop, survey tool. We are here as a supplier of land or building survey equipment, telecommunications survey tools, geological surveying or mining tools, and other survey tools including Total Station, Digital Theodolite, Automatic Level, GPS, Compass, Binoculars, Monocullars, Laser Rangefinders, Night Scope, Digital Altimeter , Clinometer, Tandem, Digital Planimeter, Distometer Speed Gun, Measuring Wheel, Measuring Tape, Grounding Tester, Handy Talky HT, Sound Level Meter, and Geological tools, PH Meters, Lux Meters, Anemometers, Thermohygrometers, Thermometers, Sirens, etc.